The current Imperial State Crown, shown here, was modified from its original form for Queen Victoria in 1838. This beauty weighs two pounds, stands 12 inches high, and is adorned with some of the most famous gemstones in the British Empire. Although George IV petitioned Parliament for permission to use his favored State Diadem for his coronation ceremony, his request was denied. 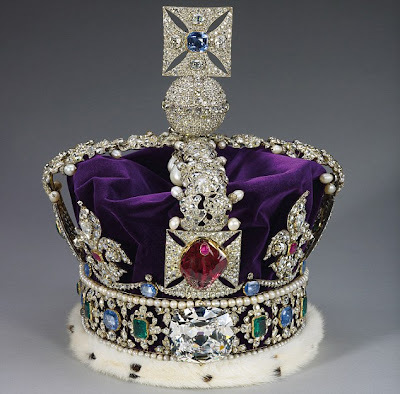 In 1821, at the time of his coronation, it was customary for the Crown (the State) to hire the gemstones from Rundell & Bridge at a rate of 10% of their actual value (£6,525). After the ceremony, the gems were removed from the crown, and the empty frame was placed on display among the other Crown Jewels in the Tower of London. Queen Victoria also had hopes of wearing the George IV Diadem in lieu of the heavier Imperial State Crown. While she was able to wear the smaller crown for most of the service, it was the Imperial State Crown which the was placed on her head after she was robed in purple and seated on St. Edward’s Chair. The last to wear the Imperial State Crown was Queen Elizabeth II, who was reported to have worn the crown for her everyday tasks throughout the few weeks prior to her coronation. Wearing the crown for tea, for reading the paper, and for conducting business at her desk afforded her the opportunity to grow used to standing tall beneath its great weight. 1. Hartop, Christopher. Royal Goldsmiths: The Art of Rundell & Bridge 1797-1843. Cambridge: John Adamson for Koopman Rare Art, 2005. 2. Fashion Era. "Rehearsals for Movement and Make Up." Accessed June 11, 2012. http://www.fashion-era.com/coronation_dress.htm#Rehearsals for Movement and Make Up.